Macintosh computers have been long considered more expensive than comparable PCs, although many Mac users might consider "comparable PCs" to be an oxymoron. That all changed with the introduction of the Mac mini. My first experience with the mini was at a local Apple Store shortly after it became available. It was also my first experience with OS X, so I spent 45 minutes getting to know the little Mac. The Apple sales staff didn't bother me, so I was free to interact with the mini and let it answer my questions. There were two demo minis running in the store. They both had the latest Apple keyboard and mouse and beautiful high-aspect-ratio Apple Cinema Displays. I knew then and there that there would undoubtedly be a Mac mini in my future, but what about the peripherals? The 23" Cinema Display was perfect for my needs but way beyond my means. And the keyboard? Well, the layout was crowded, compared my old Apple Extended and Design Keyboards. If you play a stringed instrument, you may know how it feels to switch to another one that has slightly closer string spacing or a different string length. At $29, the price of the Apple keyboard is right, but for desktop use, its compressed design just doesn't click for me. Apple's new USB Mighty Mouse is expensive at $49 and not exactly traditional in design - not that that's necessarily a bad thing. A mouse needs to fit the user well, especially for graphics work and gaming. If you can, find an Apple Store and try this mouse, but also look at the 3-button Kensington PilotMouse Optical that they sell for $19.95. Kensington also makes a 5-button "Pro" version of this mouse targeted at graphics designers for about $5 more. For another $10 beyond that, you can get the USB wireless version. Apple made the mini very attractive by allowing the buyer to use almost any Mac or PC monitor and USB mouse and keyboard. This allows for great creativity on the part of the user. Last time, I walked you through the steps of getting a basic mini for less than a quarter of its already-reasonable retail cost (see Yes, You Can Get a 'Free' Mac mini - but Is It Worth the Hassles?). Judging by the large volume of email I got about the article, many LEM readers have decided to try their luck with the promotion. I only wish I had come up with the marketing strategy behind it. This article discusses how the budget conscious Mac user can turn their base-model Mac mini CPU into a very useable system for very little cash. You can even have very good stereo sound for virtually nothing, if you're willing to get down-and-dirty and scrounge a little. Some people might think that what I am proposing here is just a tad too thrifty. Don't let anyone call you a cheapskate for outfitting your new mini this way. Tell them you're not cheap, just more resourceful than they are - then turn around and walk away before they can think of a reply. If, like me, you aren't comfortable with Apple's peripherals, new and used USB keyboards and mice are abundant and cheap on eBay. I recommend that you get a keyboard that was designed for Macintosh computers so that the keys are marked correctly. I was able to get a like-new Macally iKey keyboard (reviewed on LEM 1999.10.25) and an old round Apple USB mouse (which LEM labels a Road Apple) for less than $24 shipped. There have been some problems reported with the Macally iKey, but this one works perfectly with the mini. It also has identical layout and spacing to the old ADB keyboards I'm used to and a slightly lighter touch. The Apple USB mouse got me up and running but was clearly not designed for any human hand. I will be replacing it with an optical mouse not too far down the road. Since a Mac mini isn't exactly a serious gaming box, the monitor's best refresh rate shouldn't be a big consideration. Most multiple-resolution monitors made in the past 10 years will work fine for your mini's video, but newer is definitely better. Your best bet is to look for an older PC monitor. Chances are it won't have a DVI connector, but it will be a straightforward fit with the VGA (standard older PC) adapter included with the mini. Macintosh monitors over 8 years old won't have a DVI connector either but will require piggybacking a Mac-to-VGA to a VGA-to-DVI adapter. It's anybody's guess what you might lose in the translation. Mac-to-VGA adapters can be had for about $10 apiece on eBay. If you have been a Mac or PC user for any length of time, you may have a spare CRT monitor or two. Since I am known in my community as a free source of vintage Mac and PC support, old donated monitors, Macs, PCs, and peripherals seem to walk in the door and make themselves comfortable here. Occasionally some things will leave, going free to a good home or to the dump, but mostly they just pile up. If you don't have a spare monitor and can't find a local computer pack rat to give you one, try looking in your local Goodwill, Salvation Army, or other thrift shops. You may have to purchase a monitor with an old PC, but even so, the cost will usually be worth it. Make certain that the screen is even and bright when it's on and that there are no images burned into it when it's off. You may have to look at it from a few different angles to tell. Also, look at the border around the image. It should be very black when the brightness and contrast are set correctly. Look for a row of 5 or more adjustment buttons. They may be behind a panel. If you can't find a way to adjust the image size and shape from outside the case, it might not be a multiple-resolution monitor. If so, you should consider rejecting it. If you have no luck at the thrift shops, try your local "shopper" newspaper or the bargain corner of your local newspaper. If you can't find anything there, you may have to resort to eBay for a good used monitor. Be tenacious about finding a seller within driving distance. Unless it's a flat panel, you really don't want to have a monitor shipped. Not only will it be very expensive but chances are good that it won't be packed well enough to sustain the rough handling it will get. For my ultra-inexpensive mini system, I selected a 16.5" PC monitor manufactured in 1997 from my monitor pile. Considering that I'm used to a 20" monitor with an additional 16" display next to it, this monitor may be restrictive for some of my needs. However, it would work for most people, and it was absolutely free. Something that has been standard with every Mac from the original 128K on is at least one speaker. Most internal Macintosh speakers are really just a stopgap measure to provide basic sound support, with the exception of the Quadra 900/950, which had pretty good mono sound. If you wanted good stereo sound quality for your Mac, you plugged in a pair of amplified speakers and bypassed the internal one. With the exception of the G4 Cube, which shipped with external speakers, the diminutive mini continues the unbroken tradition of including only an internal speaker. 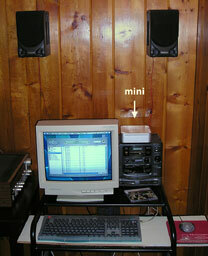 Like some of the mini's other components, its tiny speaker was probably recruited from laptop service. As such, it's really unsuitable for most desktop audio requirements beyond playing system alerts. I do applaud Apple for finding room in the case for a true voice-coil speaker and designing the case to actually enhance the sound a bit. The Mac mini comes with a stereo-mini jack for headphones or external amplified speakers. I'm going to say this once because this reference can also be found veiled in the manual: There is absolutely no need to purchase a special audio system for your computer. You may already have a good potential Mac or PC sound system lying around your house somewhere. Almost everybody has access to an old working stereo receiver and speakers, boom box, or bookshelf stereo. It may be collecting dust in a closet, attic, or basement. Check with your friends and relatives. Go and get it. If it's working and it has left and right auxiliary stereo RCA input jacks or one stereo-mini input jack (like the headphone output on the mini), you're in business. If your receiver has RCA inputs, you will also need an RCA to mini-pin stereo adapter. You can make or buy these inexpensively at any electronics store. 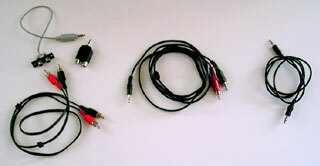 You may also need a pair of stereo RCA hookup cables if you don't already have them. If you receiver has a mini-pin input jack, you will only need a stereo-mini-pin to stereo-mini-pin connector cable. You are now ready to give your little Mac mini an authoritative voice - or the sultry "Kathy" voice, if you prefer. Keep in mind that your old stereo speakers weren't designed to be used in close proximity to a computer monitor. Speakers that are not designed for computer use are rarely shielded. At some time, you may have seen a TV or monitor that had an odd rainbow effect somewhere on or all over the screen. That unit had been in the vicinity of a strong magnetic field, like one created by a big loudspeaker magnet. Most modern CRT monitors have built-in degaussing, but some (like the old 14" Macintosh Color Display), were susceptible to this problem. For safety, keep all non-shielded bookshelf-type speakers at least two feet away from your monitor. Multi-driver systems containing large subwoofers with massive magnets may need to be kept even farther away. Have your monitor turned on and the system booted and awake when positioning speakers. Watch for any distortion of the screen and back the speaker off if you even think you are seeing it. I found the above vintage stereo radio/cassette receiver in my house when I moved in. It has RCA inputs, but the speakers were missing. The speakers pictured were liberated, enclosures and all, from the family Toyota when it died. It's not pretty, but it makes a fine computer sound system. Once you have your audio components positioned, plug your mini-pin to RCA adapter with cables or dual mini-pin cable (whichever is appropriate) into the Mac mini's headphone jack. Plug the other end(s) into your receiver's auxiliary input jack(s). Make sure the speakers are connected and the receiver is plugged in, then go ahead and turn it on. You may have to set a switch on your receiver to "Aux" or whatever other input you have your mini connected to. Now start your mini. 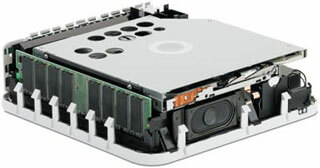 The internal speaker will play the boot tone, but all other sounds should come through your audio system. My sound system for the mini, consists of an old bookshelf CD player/cassette system. The CD player quit working several years ago. It had no auxiliary inputs, so I found the three (left, right, and common) leads that went from the CD section and into the internal amp. I clipped them at the CD board, soldered twin RCA jacks to the ends, and mounted the jacks on the back of the case. The CD player's lid makes a good perch for the mini and keeps the footprint on the desk to a minimum. The speakers are firmly attached to the wall behind and above my computer desk. This not only gets them out of the way but precludes them from being accidentally knocked over near the monitor. This recycled audio system sounds better and is much more adjustable than most commercial amplified computer speakers which, by the way, don't come with working cassette decks and a radio. The total cost of outfitting my Mac mini, including keyboard, mouse, and audio adapters and cables was about $30. I will probably spend another $25 on a good new optical mouse. The fact that you can get away with this kind of scrounging is a testament to the design of the Mac mini. Go ahead, feel free to revel in your resourcefulness!